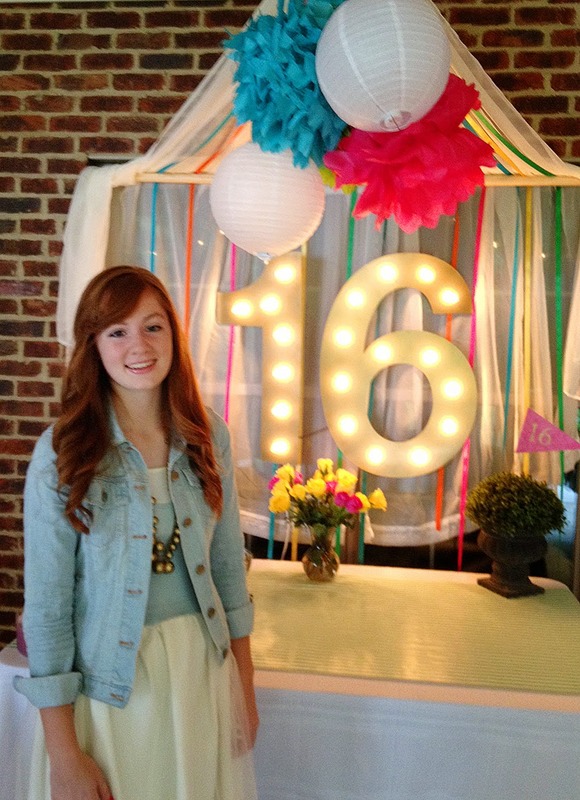 So this is the week that our red-headed, Disney-loving, piano-playing, smile-sharing, kind-hearted Abby turns 16. And if you read my last post, you know I’m in the mood to make the most of every moment I have with my kids and do life big. Not to mention, I live for throwing parties. So, that’s what we did this weekend. It was Abby’s dream to have a big backyard party with friends and family and watch “Tangled” on a big screen under the stars. And since she doesn’t really ask for much, how could I say “no”? So, Abby and I pinned all kinds of inspiration for weeks. And then, with lots of amazing help from my husband, we pulled out chairs and blankets and furniture from all around the house to transform the yard into a backyard theater. For daysI had prayedfor good weather, and (thank the Lord) He gave us a great night that was just the right temperature and not a drop of rain. We kept it simple with the food. A nacho bar, drinks and cupcakes made up the menu, which all seemed to be hit with the guests. And although I drew the line at Abby’s request for everyone to release glowing lanterns into the sky just like they do in the movie, I did come up with some colorful paper lanterns, which I’ll show you how to make later as well. The biggest hit with the kids was probably the popcorn bar and soda cart. SO much fun to put together! Do you recognize this furniture from around my house? I totally enjoyed putting everything together to give Abby a special night, and I can’t say enough how great my husband was in making all my ideas come to life. And a big thanks to Denise for all her help on party day. She loves planning parties as much as I do, so I’m so glad she was well enough to be there. And we definitely had the best guests ever, who all chipped in after the movie and had the whole yard cleared in no time! There were just enough friends, and just enough laughs, and just enough magical moments to make it a very sweet 16th birthday party. This entry was posted in Uncategorized and tagged Abby, Birthdays, Entertaining, Parties. Bookmark the permalink. Follow any comments here with the RSS feed for this post. Post a comment or leave a trackback: Trackback URL. How fabulous and fun was this. What a great idea for a party. Your daughter is stunning. Thanks, Marty! So very sweet of you! I love it! Where did you get the screen? This is something I've wanted to do for my boys and their friends. I can't wait for the details! Your boys will love it! It's so fun! I have a lot of details & sources coming, so stay tuned! 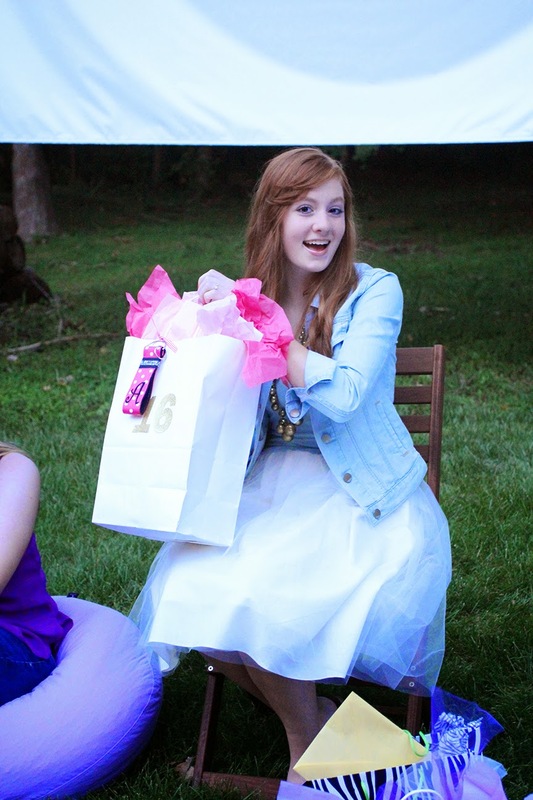 I love that your daughter wanted a mixed generation Sweet 16th party, that is very special and it looked like a blast! Yes, she chose the guest list and definitely wanted, not only her close friends, but their families as well! It was a fun group! What a fun party! You are a great Mom and she is a lucky girl! Your daughter is so pretty! Happy Birthday! I love your party. It gave me some ideas and inspiration. Wonderful! So very sweet of you! Delightful party! That cake looks yummy. Can you share the recipe?? I want a piece right now, this minute! Oh my! I wish I could give you a fancy recipe, but the cake was Betty Crocker 🙂 3 basic layers with 2 cans of whipped vanilla frosting in between 🙂 it did taste delish, though!